The full-color Lyman 50th Edition will be available for the first time at the upcoming NRA Annual Meeting in Louisville, Kentucky on May 19-22, 2016. The Hardcover Edition (item #9816050) is priced at $39.98, while the Softcover Edition (item #9816051) retails for $29.98. 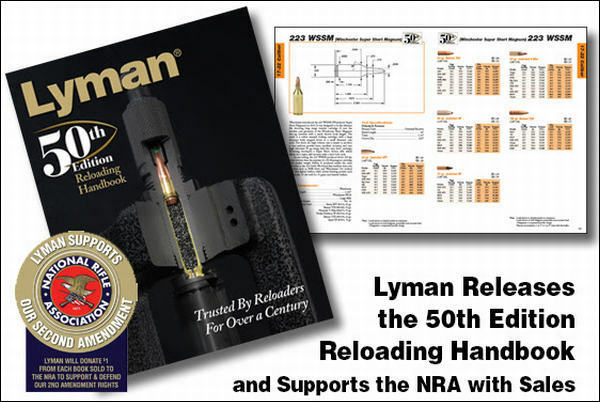 Notably, Lyman will donate $1.00 to the NRA for every Lyman 50th Edition Reloading Handbook sold during the first year of its publication. Share the post "Lyman Releases 50th Edition Reloading Handbook at NRA Show"